William Clark Studios is getting ready for another Eastside Culture Crawl. 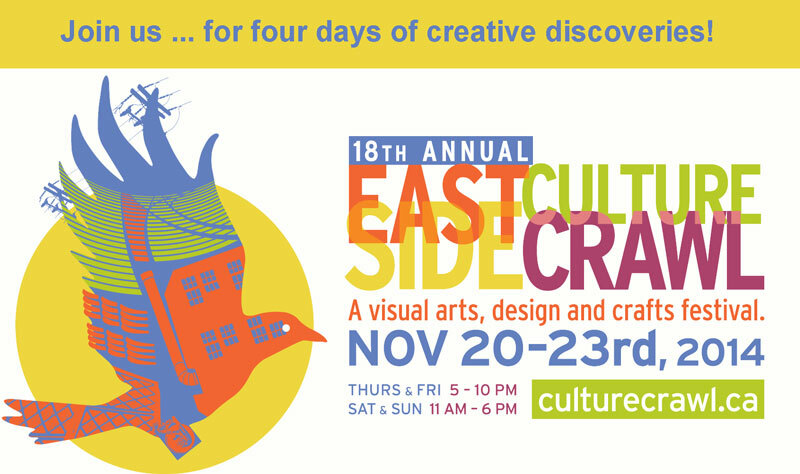 This year our building (one of the largest in the crawl) has 26 artists participating in the 4 day open studio visual arts, design and crafts festival . At William Clark we have a great mix of painters, sculptors and textile artists, with a flavour for everyone. It is a great opportunity to find that perfect piece you’ve been looking for, or that delightful, unimagined surprise. Is it your first art piece and don’t know where to start? Are you adding to your collection? Are you looking for that special gift? Perhaps you simply want a peek at the artists’ working spaces and find out a little bit more about their process. Whether you’re buying or not, this is a great free event where you can appreciate the work of many artists, chat with the creators, and perhaps get inspired yourself! Bring your friends, come with your family, and share with them who your favourite artists or pieces are. Go solo to really absorb it all and come back with your peeps later, or vice versa. It’s four days so there’s time to do it al….most all. I hope you come by to say hello and see what I’ve been up to in the past year. You can find me in studio #5 (up the stairs, straight and left before the lobby) in the William Clark building at 1310 William Street (on the corner of Clark Avenue). Check out my facebook page. I’ll be sharing some teasers of the work I’ll be showing this year, and sharing some of my favorite artists from the many studios participating.